Entering the professional world can be intimidating. That's why CESA has organized events and programs to prepare you for a smoother transition. Each of our events and programs assist in providing opportunities to create connections, build networks and improve yourself. Take advantage of events and programs for a smoother transition from student to professional! Looking to meet students in the co-op program? Look no further! Attend CESA's Student Mixer for an evening of networking with junior and senior students in the co-op program. Are you a co-op student? Do you want to hear about how work culture is different from school? Or would you like to share your story about your first work term with a new co-op student? If you answered yes to any of the above questions, you should consider CESA's Co-op Mentorship Program. Come out to CESA's largest and most anticipated event of the year, the Top of Class Etiquette Dinner. 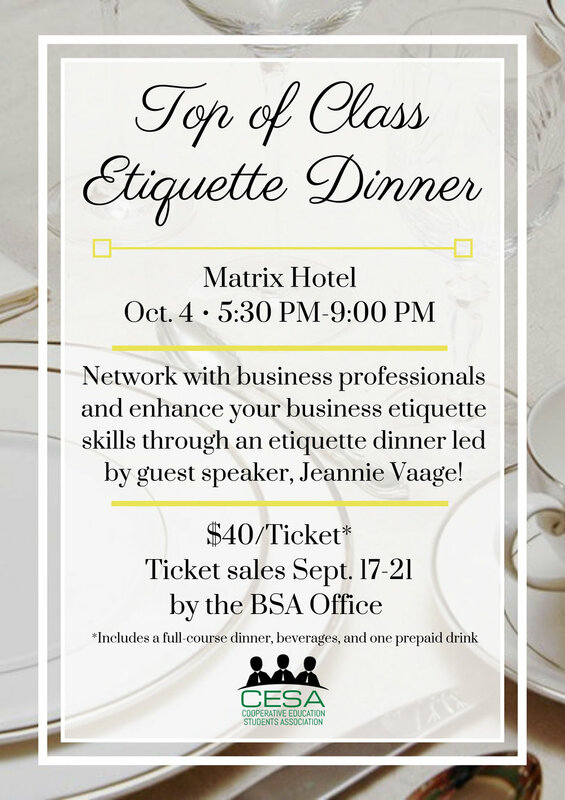 This is a great opportunity for students and business professionals to network, and to enhance your business etiquette skills through a dinner!